Clients struggle with point to point integration of multiple data sources such as applications, data stores, external market data and more. This complex nest is often referred to as hairball or spaghetti architecture and it's very difficult to manage leading to costly maintenance and development costs. Rebar utilizes its integration bus technology to greatly simplify and clean up this messy architecture. By creating a one to many integration, it allows each new data source to integrate once to the bus and be accessible to all other integrated systems. In addition, the bus easily identifies all data elements being passed from each system reducing integration costs, development complexity and time to market. The event bus can handle any type of data including high speed, high volume data such as market data, trade data, news, media, messaging and more. Due to the large volumes, companies historically stored this data into large data warehouses or Hadoop architectures. These solutions are typically used 'after the fact' and are not equipped to handle the real-time needs of today's marketplace. 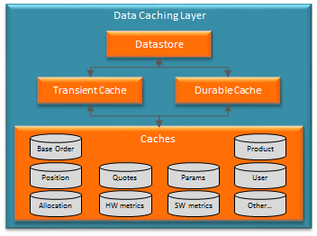 Fortunately, Rebar can accommodate all of this data into our Data Cache Layer, an event driven architecture that stores data into an in-memory datastore that's designed to be accessible real-time by any application, business module, algo, or analytic within the environment. Data can be read, created and written back to source systems real-time. This is known as complex event processing. 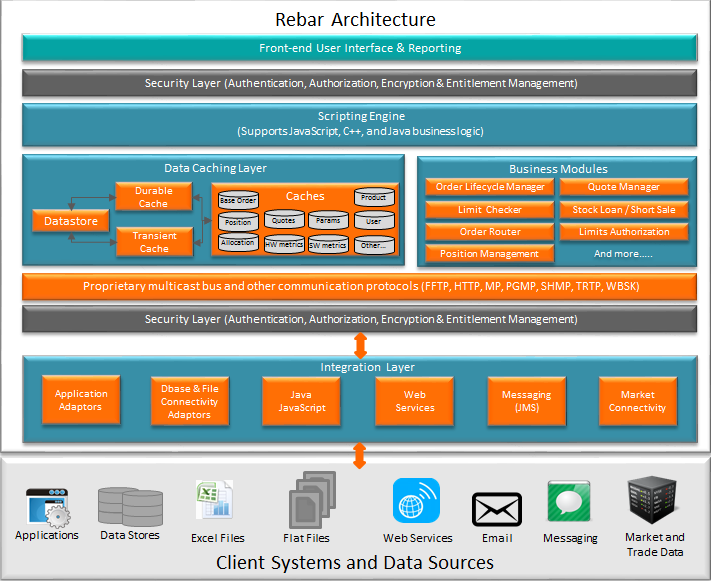 Rebar's architecture simplifies the collection of disparate data via our proprietary bus and data cache layer. It allows for the simple injection of business logic, such as trading algorithms, via our proprietary scripting engine. It provides a foundation and toolkit for custom development of real-time applications such as an EOMS, business modules such as limit checker, and reports such as global P&L and position report. It can also collect and source disparate data to other downstream applications such as collecting and normalizing trade data from multiple disparate Execution Management Systems and feeding a central Order Management System. Since the architecture is data agnostic, it can be used to manage any type of data from building a support desk to monitor and manage applications and hardware to collecting global data for post trade analytics. In this way clients are able to cost effectively evolve their business to meet the complex challenges they face today.